What do people do all day – people work and people play. We are a family of champions in the play department but this post is all about the work schedule so don’t expect masters of perfection here!!! Trust me this is a rough schedule… with time limits flexible and distractions numerous… not to mention wanderings after interesting topics that have nothing to do with “school” and everything to do with learning. About the only thing that is consistent time wise is mealtime: we all need a food and fuel routine! Everything else slides around, but we follow the same order of doing things everyday. Hard followed by easy, “carrots” for getting through tricky bits and heaps of down time because I really think that it takes time to process all the facts they absorb. So lots of time to dream, stare into space and just general idleness. That being said, if work is marked off and scheduled for a day it does get done. And food is our motivation! Finish your math before a snack, finish your file before lunch, finish your chores before supper and so on. It works and only once per scholar have I ever had to go further and finish work that didn’t get done on a Saturday morning and miss doing something with the loved and adored father person. I don’t know, maybe when they are older it will change but so far so good. Also, I don’t mind if they take half an hour or the all day to do their work and different personalities do it differently. But they must not expect me to sit with them the entire time – I am the mother person not the entertainment and they are one of many and know that I will always help with a problem but if they waste my time then meals run late and then nothing goes well!!! I really never knew how much we were about food till we started blogging. We have an understood house rule: When you wake up in the morning you read until almost everyone is awake… I get up with the first kidlet in the morning, usually Hood #7 and head for the couch. She “reads” and I work on my blog for the day for about an hour before other kidlets start trickling through. Hoods #1 and Hood #2 don’t emerge until they have done their school Bible Study, History and Science readings for the day. And this year, now that Hood #3’s reading is at a competent level of reading Chapter Books with ease, she will do her Bible reading as well. When my little guys get up I pop on the couch and do the Bible Readings from their Cores with them. 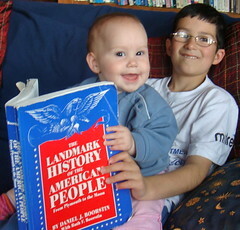 And I help Hood #3 through her history and science reading. I need their science read before we start morning school because they can only fill in their science sheets once they have done the reading! 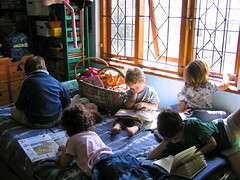 Chores at 7:30: Most people are up and about (sometimes there will be a late sleeper – never disturb a sleeping child!). We do a couple of chores: Clear the dishwasher get the laundry going, beds made and such like. Breakfast at 8:00 am. During breakfast we have a discussion on what they read in their Bibles, History and Science everyone gets a chance to speak and I don’t usually have to ask leading questions – knowledge flows!!! Hood #4 is always finished first and while everyone else is catching up and getting their dishes to the dishwasher I do his reading lesson one on one. Then everyone dashes off to brush their teeth and here I can easily lose the whole day. It is hardest for me to get them back to the table. So I have a “carrot”. We always start the day with some sort of creative writing project. Sometimes I give them a writing prompt, sometimes they get to draw a picture of that weeks poem, they may write any letters that need writing, sometimes I have crept into their journal and stuck a picture for them to write about. The list of ideas is really endless here. They love it and so do I. We spend about half an hour on that. Even my littlest guys join for this because they all want to do some school – so drawing picture or whatever helps them to feel part of the family but isn’t burdening them! Then we move onto math – some people agonize through it, some people grind through it and some people breeze through saying “dunnit!” as they go. For all this they all perform pretty much the same. I never offer help. I am present – hanging out the laundry, getting bread going for lunch. It is their school, if I sit with them I tend to do a lot more than I should and they tend to do a lot less than they should. If they need help of course I am there, but I like them to be able to plod along. My presence is more for policing than for teaching. You know, telling some one to stop reading a book on the sly and refocusing wandering minds. 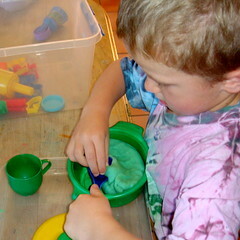 At this stage my little guys are not very far off – they may be washing dishes or doing play-do or even playing with math manipulatives (someone has to use them!!!). As soon as they finish their math we have our mid-morning snack. 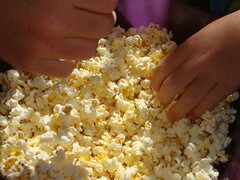 If someone is lingering they don’t snack – generally they finish! I need another carrot to get them back to the table. So I read someone’s poetry and just work through the poetry pile, a book a day through the week. By now my little guys will have wandered off during the snack and will have got involved in their own game. The big guys start with any spelling or vocabulary project that they are working through. Then they move onto grammar goodies and the language art sheets in their files. I am preparing lunch and will give anyone a hand if they need it. Sometime later in the morning Hood #7 will take a nap and the little guys will come with me to the couch and we will read their history and science then. Once they have finished their language arts they are rewarded with their science. The Quiz sheets are in their file, they fill them in and write any notes that they want to write in their science notebooks. New definitions or some interesting factoid. Or illustrate something they learnt. Also if we are working through science experiments then this happens now quickly before lunch. Lunch At Last – we eat between 12 and 1 pm. And I do our daily family Bible Reading and if we are reading a family read aloud (not a school one – there lots of books that my children need to absorb but they aren’t amongst their school books) I do it then and we clean up together. Everyone heads to read for a quiet hour. The older guys read their readers and read alouds. Everyone reads their own thing for an hour, even I do. Some people may or may not pass out and have a nap – including me! At the end of the hour the musicians practise for about 20 minutes and I read the little guys their readers and read-alouds. That’s it school’s out. And the afternoon is theirs: they usually cycle or swim or skateboard for about an hour and play furiously the rest of the time – it may be the last day of play – ever, ever, ever!!! The carrot at the end of the day is something arty. A famous painter, a tuesday art task, watercolors, famous musician, a science scavenge. Followed by the all important snack! Once I start cooking everyone wants to be in the kitchen and generally they congregate there (just in case they get fed again!!!). At around five pm I start supper and they work in their history journals alongside me – write some notes, stick in timeline stickers. Or if they have finished their reader/read-aloud then they do a book review. And work on things I have printed off the web for them. At this stage my little guys need to do something fiddly and requiring a bit of focus – it keeps them out of the end of the day squabbles if they are busy doing something on their own. The generally play in the bread bin – with whatever is lurking there that week. That’s it – pre-supper chores (tidying and laundry away) and supper, showers, bed!!! Sometimes the big guys will leave any coloring till then – they like to do it in bed. And it is pretty much read whatever you like until lights out. 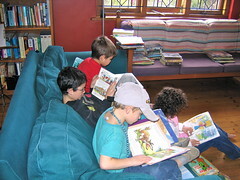 Little guys all get a library book of choice read to them. Next week I will go through exactly what we do subject by subject and journal by journal. I will demonstrate that we do stuff in a jiffy! We work smart not long! How do I keep little people busy? How do I read through all the books? How do I cope with interruptions? If you want to ask something: how to get your kid to sit there, how to cope with the volume of stuff whatever ask away and I will post a post once I have se7en questions good to go… so ask away! I love your schedule. We are trying one very similar. But we have trouble getting through math. Do your kids teach themselves their lesson? And about how long does it take them to complete math? Hi dd, Thanks for the lovely comment! I hope you enjoy visiting us again! Hay S, Aah! Math! We do have trouble getting through it. That’s why its almost the first thing we do. I find that once they can read fluently they can do the lessons themselves, obviously I check they can do it. 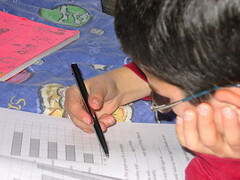 They do the worked examples first to check they understand before going on to their workbook. 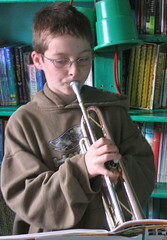 They also get lots of practice! I do help if the need it but I try to let them figure it out. That being said: the nicer the snack the quicker the math gets done!!! We operate on the carrot system as well. We couldn’t get anything done without them! Hay K, Where would the world be without carrots. I use them myself – why shouldn’t my kids. If I could just think of one to get those end of the day dishes done – aaahhh!!! I think I my having my carrot (reading comments!) first tonight! Have a great weekend! Hi L, Nice to see you! My kids are dying for school to start next week – they know I have two new Mathtacular’s waiting in the wings! Cruel mother I am… the suspense, the suspense is killing them! What do you do when they don’t want to do it? I want Jaylene to read English books regularly (because it will help her with that language and I know what she’s reading and of course all the other benefits of reading) For awhile she just didn’t want to do it. 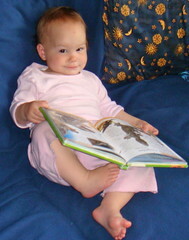 She read Chinese books (just some princess ones over and over) for the longest time. I didn’t push it ’cause I figured she’d eventually be interested in it again and after a few months she was. Do you have a different approach to keeping interest and motivation levels high? Hi Jk in Taiwan… Not an easy answer: I could say my kids love every moment of school and jump at the opportunity to do pages of algebra. But I would be lying!!! That’s a great question and I think something that mom’s have to deal with daily – I am going to add it to my se7en questions post… Because I am asked it quite often and because I don’t want to just quickly answer something that requires a little bit of thought! So watch out for it as soon as I have se7en questions I will post! Take Care and Happy Weekend! Hi se7en! I found you through Crafty Crow and stayed awhile to peruse the homeschool posts. My son is in core1 (6yr almost 7) and having difficulty with the LA writing assignments. Could you explain your journaling time in your next post? And what do you do with the LA assignments? Thanks for the help! I should be more specific: he’s a great reader but a slow writer. He gets frustrated that the words don’t get on the paper as quickly as they come mind. Hi J, Welcome to our blog… Great question. Sometimes the assignments do seem long, but there is no harm in helping… I do indeed have every intention of showing our journals on our next school post and I could also add your question to my list that I am filling up with se7en common questions before I post it! – I should probably give it a count it could well be good to go! See you soon. Thanks for this great post. I am inspired once again! And speaking of inspired – you inspired me on another post that I now can’t track down. You talked about printing out great activities and stuff for kids to do and then filing them away in their files for them to pull out whenever they want. Could you point me to some good websites along those lines and could you tell me HOW you file them away – i.e. what is your system and what filing container do you use? oh and – could you put a "tick the block" notify me of follow up comments widget on your comments. Helps me to find reply comments on your numerous posts quickly! thx! Hay T, I can indeed point you in many good directions and I will do a “se7en of the best” printables blog in the next little while – I have put it on my list. I keep meaning to do it, but now it is documented in my notebook!!! T again! Just as soon as I figure out how to do that I will do it for you. Talk about service with a smile! Hay T… Go and teach some school already! I am quite amenable to blog suggestions. However they come!!! It never occurred to me that folk would want to read follow up comments!!! Have a good day you!!! school at 8am??? I know you guys have got hours of school under yr belt by then, but at 8am we’re just starting breakfast!!! And this morning was slower than usual, so I was checking mail while the kids werre getting their pre-breakfast barleylife hit. 😉 … isn’t it great how hs looks completely different from home to h0me?! — looking forward to more 1am posts from ya! But 8am we are practically done for the day – school – completely done by then. Really I jest! 2:37am???? Is this the right time? Were you really up at 2:37am? Do you sleep?! Right T… Your comment “goody-gats” are up and you can now subscribe to comments… Otherwise doesn’t everyone blog at 2:37 am !!! Surely? Actually I never sleep otherwise my kids might conquer me – Just kidding, but I love surfing in the dead of night when the rest of the internet world is alive and responding. Hi there! I only HS my soon to be 1st grader, but I have a 3 y/o also at home and I run a daycare so it is quite crazy. (I have 3 older kids in school.) Do you buy the complete Sonlight curriculum? It runs around $800. Is it too much work? We did not do a great deal of work this past year and I worry. I think I need a boxed curriculum, but I also worry with all the kids around I won’t be able to keep up all the work. Is Sonlight a lot of work? Hi R, Yes I do get the complete package – I love how everything fits together. It is money well spent especially when you see what you are getting for it… quality, lasting books that will be used over and over again well beyond 1st grade. Compare it to the price of school fees, uniforms, extra-murals and school supplies over a year… if you are honest then you may be pleasantly surprised! I love that everything comes in a box and I really just have to open my file and go. The great thing about homeschooling is you can be totally flexible and you will both get better at it as you go on. Remember it is not sitting at a desk for a number of hours until they have done their time so to speak. For first grade I keep a pile of books for the week in a basket and read them in moments throughout the day. The bookwork: math and language arts etc is really not a lot of work. For my first kidlet we used to get on with it when he woke up in the morning between 6 and 6:30… done by breakfast! and carried on with our day. My now almost first grader, I do his bookwork straight after lunch when the other guys are finished theirs and I can give him my attention… I would just keep all the books in a basket and do them in dribs and drabs through out your busy day. Hope this helps and Good Luck! Hi C, So glad you are enjoying our blog. Have a great Day!!! Congrats on Hood 8! He is so cute! Thank you for your most enjoyable homeschooling blog in SA, lately I have a need for the truth and your site is all about honisty, Thank YOU! We are in our second year of hs and it has been a bumpy ride, our kiddies been in private school for 3yrs 🙁 grade O and grade 2. We tried just what we could find on the web, and in CNA for local is lekker then we tried Konos and now ACE..we mostly went with this as it is big in SA i thought ok we need support, friends and to be up to speed with school years, and sports, art…and if something happends and kids needed to go back to formal school then we up to speed. It turnded out to be school, submitting endless reports, deadlines.. no sport, the support…mmm..I did not want to sit for hours everyday filling in forms and writing report cards i dont think you can find more unhappy kids and a working from home mother person then our family. I am ready to give up, something is wrong they sit at their desks for hours and yip produce niks, nothing. So i say go back to school and they beg to stay at home,, my kids dont want to go back to school but also not happy with the work they do, I work for a boss but at home to be with the kids but i have deadlines and phone calls and phone calls as I would have if i been at a office. We a Place of Saftey family for abondend babies we all love this my husband (he is much older than me, and in most people books should not enjoy the baby stage anymore) but he dont say no to a little one in need, he is great with them (all our babies said dada before mama:( in 3 years we had 7 kiddies what a blessing but it comes with lots of LIFE SKILLS and no formal schooling for our two, not the best thing when we need to submit our books to the acadamy every term….oh I must say my kids loves the babies/toddlers and say that they their brother or sister it does not matter if they pink or blue or yellow they are family but the babies comes with lots of problems but mostly they unloved kids that saw more of the bad world then most adults did …Ok getting back to me giving up we handed over our baby boy to his new family..lots of tears…. so back to work and school, how we going to get to hand in work books by end of Nov i do know the kids are stressed! I know for sure we need something and fast – what do I do if I want to give up and my kids wants to stay home with me?..why do they want to stay if they unhappy. A weeek ago I found your blog and now I am on it everyday, reading and reading. Sonlight it sounds good but is it? And what about SA history and Afrikaans and Zulu lang….? SA Math – Rand cents, cm,mm? What about higher grades and grade 12 exams for SA? A personal ? How do you afford it for 7 kids…a box cost R10 000 .+ per child per year? I am not good with a lot of things and I am not sure what I should be in life but I do know my kids is my life. Thank you once again for all you do!! Hi JJ Welcome! I will try to answer most of your questions in an upcoming post… and I have answered a couple in previous ones. The question about the cost of Sonlight is that we only buy one core a year for the first child – the rest of the kids follow behind and use the same books – so it actually gets more cost effective over time, as more kids use the same books. I only buy a couple of fresh workbooks for the kids that follow behind. Otherwise I don’t know how close in age your children are but perhaps you could use one core for each of them and then get the appropriate workbooks for their current grade. Why don’t you ask a Sonlight advisor what they recommend they are really helpful and don’t expect a commitment from you. Also Sonlight is quite a different way of schooling if you are not used to it and it will take a while to get into the focus on reading to learn… it relies far less on “worksheets and busy work” to learn… also their curriculum is very rich you can easily stretch it over a year and half of school if need be – you don’t have to squeeze it into a 36 week school year… I hope this helps. Watch out for my upcoming homeschool post and watch the comments – a lot of questions get answered in the comments. You take care and have a good week. Blessing to you and your family for the week! Thank you for posting this. It’s very helpful. Hi Jennifer, I have another post that answers a couple of Sonlight questions, you may find it helpful as well… Thanks for stopping by!!! You are such a great encouragement to me. I have been reading your website for 3 years now and love your upbeat and positive outlook on life and schooling. We are using Cores B, D & F this year with my 3 boys. They do well to study their own material and follow their own schedule. My question is… how do you get all the reading in? I read bible, history and read-alouds with them from each core and help with any workbook and math problems they may have. I struggle to find time to read their readers ahead of time to discuss with them. I don’t want to miss a single Sonlight book. They are all so good. How do you do it with multiple cores and keep up with the reading yourself? 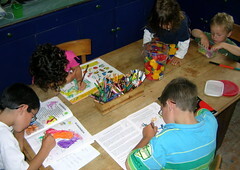 Hi Lisa, So thrilled that you enjoy our blog and homeschooling story and thanks so much for stopping by!!! I don’t read all of my children’s readers ahead of them during the school year… I only have to read the readers of our first child, since we have always used Sonlight I just read his books, and most of the books from previous years I have read on our journey. I start reading almost as soon as the books arrive and just read them when I feel like it… I am usually up to date and if someone reads a book that I haven’t read then I get them to tell me all the details and they usually tell me why I should read it already!!! A lot of them I have read already as a child myself, one of our reasons for using Sonlight was the classical literature, so I haven’t found myself to be floundering. I actually read their books because I enjoy them rather than to keep up with them!!! I think at the stage my kids are at they are pretty good at discussing a book even if I haven’t read it… often times they inspire me and I dash off and read it!!! I reckon if I have read most of their books then that is fine – it just adds a slightly different spin on it if from time to time they have a book I haven’t actually read!!! I am going to think about this a little… I have a couple of homeschool questions folk have sent in so it is time I did some school posts again!!! Thanks again for commenting, so love getting questions!!! Have a great week!!! Thank you so much for your post. I am wondering if you lay out some sort of schedule for all your kiddos, or if they just read the Sonlight schedule themselves? I’ve looked into “self-motivational” homeschool planners, but that seems redundant unless one is using a curriculum that doesn’t come with a weekly plan. I have a 7, 5, 2, 1, and soon another 2 yr old, and am not sure how best to schedule Sonlight. I LOVE to include the little ones as much as possible because I’ve found they soak up a LOT by simply being in the same room with us. Thanks so much! Hi there, Jaelle, Scheduling is a tricky one – what works for one child may not work for another, and there are so many seasons of life that one needs to adapt and be aware of necessary changes and adaptions for those too. Over the years of homeschooling we have been pretty flexible with our schedule – always tweaking and changing and adapting for individual children and as our family dynamic changes… I blogged another very detailed schedule post but even though the details of our days may chop and change – our school days pretty much always look like the one I descrive in this: Day in the Life Post. You are so right that the more you include little ones the better… and while I don’t actively include them they do learn a tremendous amount just by being in the same space as we are!!! In fact, since we all pretty much sit at the same table and I start with the youngest and work up… everyone is always listening, if not with their full attention, to the reading from the years above and below them… and there is an audible gasp from around the table when I close a favourite book from any grade and say… “Enough of that one for the day!! !” Wishing you all the best on your homeschool adventure… give it time and you will find a good schedule fit that works for your family!!! I’ve just stumbled upon your blog and I absolutely love it! We are in our first year of Sonlight and my 5 & 6 yo are both doing P4/5 with LA1. We’re almost ready for Core A. You mentioned that your LOs read every morning until everyone is awake. Wonderful idea! 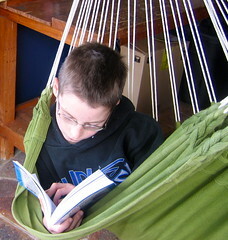 Can you give some examples of books your young ones have enjoyed for leisure reading? What are some of your fave books for beginners? Okay, I thought of another question. What are your thoughts on Sonlight’s LA? Like I mentioned above, we are currently doing LA1 and I’m not too thrilled with it. The LA portion is the ONLY thing I do NOT like about Sonlight. Based on several reviews, I’m not the only one who thinks the LA portion is weak. How do you make Sonlight’s LA portion work for your family? I hate to supplement when I’ve already paid for this, but I don’t feel it’s thorough at all, as compared to other options out there. Your thoughts?